St. Brigid's Minor Footballers claimed the Tom O'Donoghue Memorial Tournament in Ballymun on Monday evening by winning all three of their matches. The tournament played in ideal conditions involved three 15 games of 15 minutes per half. First up was a game against the hosts, Ballymun Kickhams. After falling behind to an early point, Brigids settled into the game with a couple of points from Mark Donnelly before a Josh Connolly goal extended the lead further. By half time, Brigids led by 1-4 to 0-2. The second half was a low scoring affair, with Darragh McKenna getting Brigids only score. A late goal from the hosts brought the gap down to three but the game finished with the Russell Park lads winning by 1-5 to 1-2. Next up were St. Sylvester's, who had also won their first game. 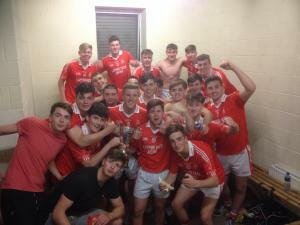 It didn't take long for Brigids to assert their dominance with Tiernan McGlynn to the fore. He contributed 1-3, with Connolly again raising the green flag as Brigids cruised to a 2-7 to 0-1 win. The final game was a winner-takes-all match against Na Fianna. And it was the Mobhi Road side who took an early advantage as Brigids struggled to make the final pass count, as they led 0-3 to 0-1 midway through the opening 15 minutes. A brace each from Donnelly and Donncha Ryan, however, left the half time score 0-4 to 0-3 in Brigids favour. In a tense second half, it was end to end stuff with McGlynn getting a point to cancel out a Na Fianna score. A Tadhg O'Shea goal as full-time loomed put some daylight between the teams but it was to be short-lived as Na Fianna responded with a goal. However, a late Jack O'Neill point was enough to clinch the match and the silverware for the Brigids lads. Manager Keith Barr said "I'm delighted with the win which is a great start to our preparations for the upcoming championship campaign." St. Brigids: A. Olaeru, J. O'Neill, S. Egan, E. Devitt, D. McCabe, M. Tighe, T. O'Shea, D. Ryan, D. McKenna, M. Donnelly, T. McGlynn, D. Kiely, D. Hawkshaw, J. Connolly, J. McGuirk, C. Burke, A. Dunphy, A. Gleeson, C. Henry, K. O'Doherty, M. Barr.